Now Accepting Applications for the upcoming 2019-20 School Year. We will have hundreds of used books to choose from – storybooks for all ages, fiction and non-fiction, used games and puzzles, plus a nice selection of baked goods and reasonably-priced used bikes. An outdoor celebration & family picnic with children’s crafts & Maypole festivities. Our Kindergarten/Preschool Tours are structured to be an adult orientation/information session. We request that children do not attend these Early Childhood Program Tours. We welcome Grade School students to attend our Grades 1 – 9 Tours with their parents. Waldorf® education addresses the learning needs of the whole child, developing: clarity in thought, balance in feeling and conscience and initiative in action. 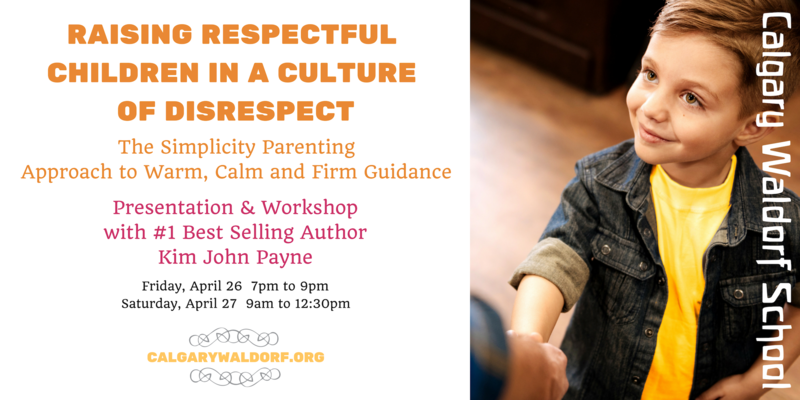 The Waldorf approach recognizes that children have distinct, age-related educational and emotional needs that unfold through stages of their development. To meet these needs, the Calgary Waldorf School’s rich and challenging curriculum carefully balances academic, artistic and practical activities to stimulate intelligence and encourage creativity. Our nurturing social environment helps children develop exceptional interpersonal skills, self-confidence and self-reliance, fostering their own personal integrity and sense of social and environmental responsibility. The Calgary Waldorf School is an independent private school founded in 1985. It offers Parent and Tot programs, Preschool and Kindergarten and Grades One through Nine. Have a look around our website to explore the unique world of Waldorf Education and discover the advantages it can bring for the growth and development of your child. Waldorf® is a registered service mark of the Association of Waldorf Schools of North America (AWSNA) and is used by agreement of membership in AWSNA. Waldorf 100 – The Film (Part 2) – New Release! The theme of this new film is “Encounter, Engagement, Inclusion” and it features schools from around the globe. The particular emphasis of the film is on schools that are working in very important ways to advance the social mission of Waldorf education, such as the Community School for Creative Education in Oakland, schools in Jaffe Israel that serve both Arab and Israeli students, and the Parzival-Zentrum school in Germany which serves a high population of refugee students. The New York Times sparked national media coverage with its front page story on why Silicon Valley parents are turning to Waldorf education. This film picks up where that story left off. Preparing for Life takes viewers inside the Waldorf School of the Peninsula where the focus is on developing the capacities for creativity, resilience, innovative thinking, and social and emotional intelligence over rote learning. Entrepreneurs, Stanford researchers, investment bankers, and parents who run some of the largest hi-tech companies in the world, weigh-in on what children need to navigate the challenges of the 21st Century in order to find success, purpose, and joy in their lives.